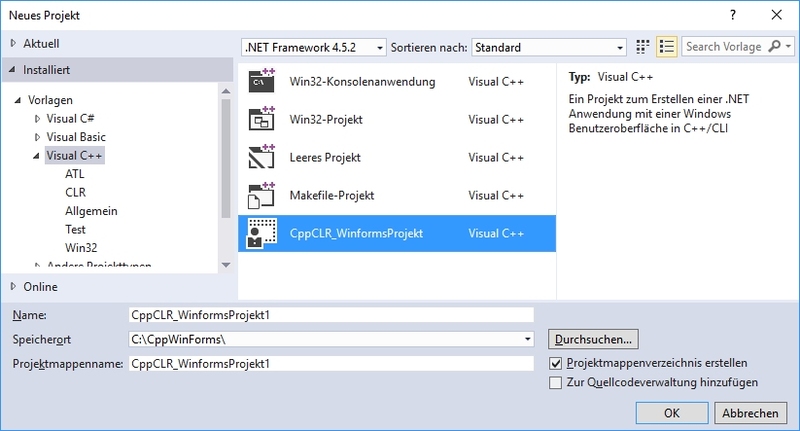 Mit dieser Erweiterung können Windows Forms Projekte (.NET Anwendungen mit einer Windows Benutzeroberfläche) in C++/CLI mit Visual Studio 2017 erzeugt werden. Applications created by such projects have a graphical user interface. C++ Windows forms projects are a simple way to create C++ programs with a graphical user interface. The programming language is standard C++ for the business logic and C++/CLI (a C++ dialect) for the interaction with the graphical user interface. C++ Windows Forms projects are great for learning C++. Visual C++ for Windows Forms (C++/CLI) has nearly all standard C++ 11/14 language features. Since the programs are not restricted to a simple console for user interaction, they are more attractive, more flexible and much easier to use. For students, GUI programs are much more motivating than console programs. Of course, you are not restricted to simple programming excercises. You can also write serious C++ applications. And if you have old C++ console programs, you can revamp them with a GUI.